How soon can I get a service estimate? We can usually meet with you within 24-48 hours upon your request to provide an estimate. What type of liner selection do you have? We offer only the finest vinyl liners and there are many designs to choose from. We will be happy to meet with you to help you find your favorite style. Vinyl Liner King has been serving the Dallas area for more than 50 years. Our highly-trained professionals have the knowledge to provide you with the solutions you need. How easy is it to communicate with Vinyl Liner King? It’s simple. You can reach us by phone 972-285-6817, E-mail: vinyllinerking@yahoo.com, or through the “Contact Us” tab on our webpage. If you encounter our voice mail, it is because we are giving our undivided attention to another customer. We will return your call promptly. With liner installations, we can offer other needed repairs. Vinyl Liner King specializes in vinyl liner replacements for in-ground swimming pools. We can provide thorough service that will have your pool ready when your liner is replaced. How can I find out if you work in my area? 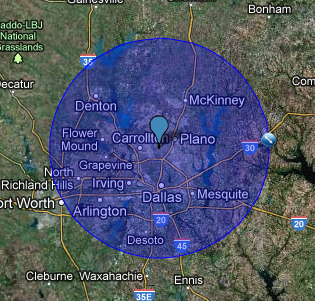 We offer service in many parts of the Metropolitan area. It is best to call us to confirm if your area qualifies.